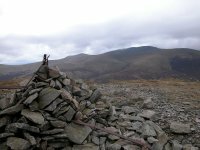 On the first day of the Mayday holiday weekend of 2005 I decided to attempt quite an ambitious walk, my first in the Calbeck Fells or "Back o' Skiddaw". 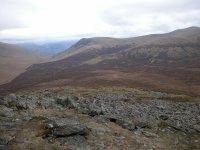 I planned a route taking in High Pike, Knott and Grear Calva, plus a handful of othet "tops" on the Nuttalls list, with a return to Keswick along the Glenderaterra valley. The bus from Keswick to Caldbeck only runs on Saturdays at this time of year so I had no choice of day. The weather forecast wasn't good - we were promised a cloudy day with spells of rain, perhaps heavy and persistent. But the mood before breakfast was cheerful, it was bright and fresh, and it just didn't look like the kind of day that's going to turn dull and wet. 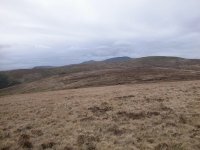 I decided that I'd go to Caldbeck at least, and if the weather still looked OK I'd climb my first fell, High Pike. I's make a further decision on the prevailing weather at that point, and either walk back down to Calbeck for a return bus or commit myself to the rest of the walk. I arrived at Caldbeck just after 10am. The weather was still bright, with a very watery sun visible at times. 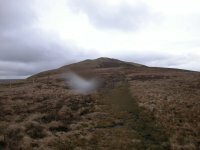 I set off for High Pike, three miles away, initially by a back road to Nether Row. This is High Pike seen from the road. From Nether Row an old mine road runs part way up the fell. The old mine road peters out at about 1550 ft, at an old shaft a little way above Potts Gill mine. The terrain was a bit on the drab side, consisting of open fellside cloaked in rough grasses. 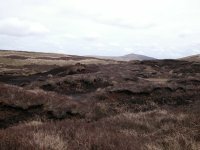 A meagre track continues around the west shoulder of High Pike. I'm looking back at Caldbeck from here. 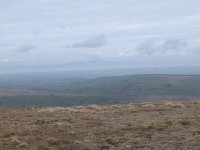 The Caldbeck TV mast can be seen to the left, and the coast of Dumfriesshire is dimly visible across the Solway Firth. With no path to the summit shown on the map I left the track and climbed up the grassy slopes above, zig-zagging diagonally to ease the gradient. It was tedious work but eventually the gradient eased and I saw the summit not far ahead. This is the top of High Pike, 2157 ft above sea level. 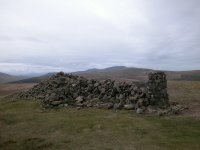 Beside the trig point and the massive elongated cairn is a feature unique to Lakeland's summits - a bench seat, fashioned from stone. According to Wainwright it dates from 1961and is a memorial to Mick Lewis of Nether Row, and replaced an earlier wrought iron seat. 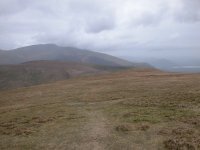 Skiddaw, a massive and rather grim-looking hill from this angle, seen to the south west. The ruin of the old shepherd's cottage north of the summit. The Solway Firth and the Caldbeck TV mast can be seen again. Panning west a little from the shot above brings Criffel, on the other side of the Solway Firth, into view. The BBC TV and radio mast at Sandale is also in shot. The weather was still holding and I saw no reason to curtail the walk. 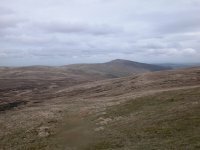 I strolled southwest off the summit of High Pike towards the junction of three paths, tha faint ridge path and the two coming around either shoulder of the fell. 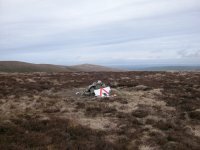 Not fifty metres northeast of the path junction is this tiny cairn, marking the summit of Hare Stones, a minor top of High Pike qualifying as a Nuttall. The view from Hare Stones. I'm not entirey sure as landmarks are at a premium in this area, but I believe this is the view eastwards towards Carrock Fell. From the same point I'm looking south west to my next main objective, Knott. 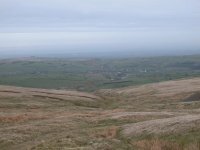 It's the highest of the Calbeck fells and quite remote from civilisation. Skiddaw rises behind. Looking back towards High Pike. In the middle distance, perhaps half a mile away, is my next objective, Great Lingy Hill. A tiny speck of white marks the summit. Getting there involved a walk across trackless rough grass and heather. 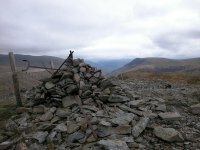 The white speck turned out to be a "men at work" roadsign built into the cairn. It's the only interesting feature of Great Lingy Hill, save that it also qualifies as a Nuttall. 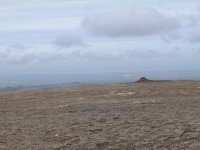 Another fifteen minute march across further wastes of rough grass and heather saw me at the top of Little Lingy Hill. It's a finer and better defined hill than its bigger brother, but unfortunately at 1998 ft high it just fails to get into the ticklists. Strictly, the name Little Lingy Hill is appended to the slopes to the south rather than the top. The hill is also known as Iron Crag, though strictly this is a feature on the northern slopes above another old mine. 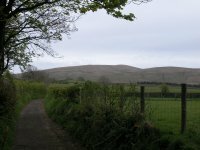 From Little Lingy Hill I've got my work cut out, for the next three quarters of a mile involves a descent to the col of Miller Moss then a climb of the steep northern slopes of Knott, all over pathless country. There's a lot of heather growing here and the walk is going to be tedious. Once I got above the heather I found a good line of ascent, and discovered a faint path in the grass. It's presumably the usual route from High Pike and Carrock Fell. 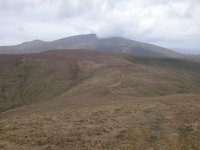 That is Carrock Fell in view, looking back along my ascent route. 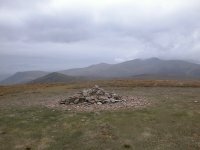 The summit of Knott, 2329 ft, and a beautiful patch of turf. Heaven knows what serves to keep the grass so short and sweet up here because there is no sign of any grazing sheep for miles around. The vast bulk of Skiddaw is in view here with Lonscale Fell over to the far left. 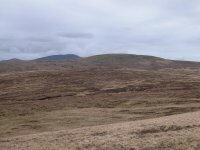 The cone shaped top in the middle distance is Great Calva, which will be my final top of the day. 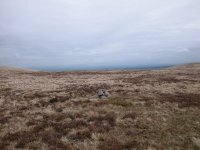 To get to Great Calva from Knott I have to walk around the head of Wiley Hill in a wide arc. A good path descends to the col. Skiddaw and Bakestall are seen beyond, with a glimpse of Bassenthwaite to the right. There's the col just below. Skiddaw is seen beyond, a cloud just brushing its summit. 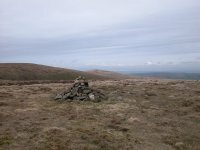 I descended to the col but left the path at that point to visit the minor top of Little Calva, a Nuttall, half a mile ahead. There was a path of sorts at first but it peterd out. 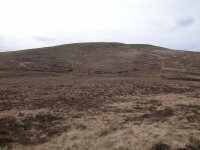 Little Calva is a horrible place, a nasty and extensive waste of heather-cloaked bog over which progress is slow and tedious. It didn't help that it chose to spit with rain as I sought out the highest point. Eventually you reach a fence but it's difficult to follow thanks to the pools of stagnant water either side. I found this cairn on the other side of the fence. 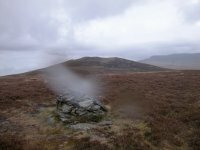 I didn't realise until I got home but there was rain on the lens when I photographed the cairn. 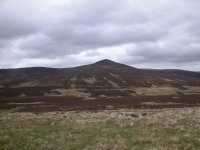 It will have to do, I doubt very much whether I will ever bother to visit Little Calva again. 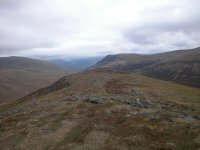 There was a path of sorts between Little Calva and Great Calva, running ten or twenty metres south of the ridge fence for the most part. It's a splendid trek for those who enjoy wading through soup. The only relief is when you swap slop for steepness. 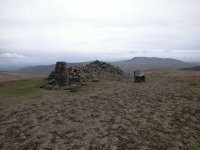 My final summit of the day, Great Calva, 2265 ft. It's in an interesting situation, overlooking the whole length of the Glenderaterra Valley and beyond that the Thirlmere gap towards Dunmail Raise. 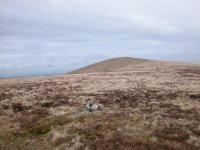 The slopes of Great Calva, unlike its summit, are cloaked in heather. The descent path is obvious at first but it becomes ever thinner as it loses height. At least the terrains is relatively firm, dry and even and one can strike up a decent pace. 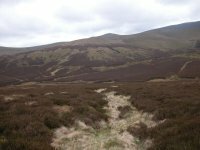 The path veers to the right, eventually descending to the Skiddaw House access drive about half a kilometre northwest of Skiddaw House itself. 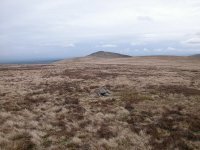 The heathery dome of Great Calva from Skiddaw House. I had a very long walk back to Keswick from here and the day proved to be very tiring. I chose the wrong track in the Glenderaterra valley and found myself heading around to Threlkeld. I could have saved some effort by walking into the village and taking the bus but I was on schedule to miss one by five or ten minutes. Faced with this delay I found a footpath down to Derwentfolds and then took the woodland path alongside the Greta back to Keswick. 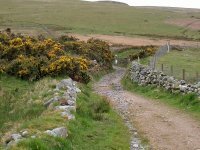 I'd reckoned without the ups and downs of this path, which I was really too tired to trackle. Back at the hotel I plotted the route on the laptop and discovered that I'd walked about 15.6 miles with 3600 ft of ascent. No wonder I was shattered. But despite the iffy weather and the tiredness I'd had a thoroughly satisfying day. Now available on CD - the high resolution (2560 x 1920 pixel) originals of the images on this gallery. 35 images, 51MB of data. (includes some images not selected for the website).